Mycelia are modular and can fragment to form spatially disconnected units. 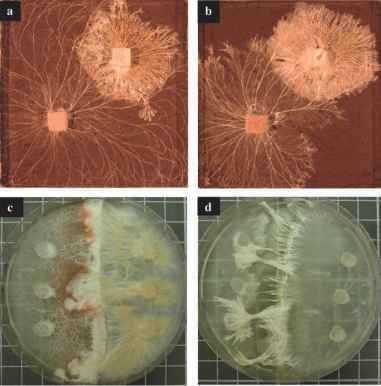 Fragmentation of a mycelium might act to change the dynamics of colonization since each fragment might start a new independent colony. The dynamics can be described using exponential rather than linear models, with polycyclic and monocyclic dynamics as in plant pathogenic epidemiology (Van der Plank, 1963). On the other hand, mycelia can be large (see below and Chapter 1), although to what extent they then function as integrated units with concerted energy and nutrient use is not known. Integrated activity provides the potential for increasing competitive strength in foraging and/or in interactions with other organisms. This has implications for nutrient cycling; integrated mycelia are far less prone to nutrient limitations than isolated units (Cairney, 2005). Mycelial systems might transport nutrients over several to many metres (Boddy, 1999; Chapters 1 and 3), and saprotrophic mycelia translocate carbon from woody material to foraging mycelium and even more so to mycelium in connected woody resources (Wells and Boddy, 1995a; Wells et al, 1995). Interaction studies indicate that mycelial systems with large resources are stronger in combative interactions and in colonization (Holmer and Stenlid, 1993; Wells and Boddy, 1995b; Lindahl et al., 2001). This relates to the concept of inoculum potential—the energy available for a mycelium at the point of infection—often used in plant pathology (Garrett, 1956). Studies so far have indicated that large, ancient (1,000 years) mycelia are genetically stable with no mutations within two studied genets, and concluded that either the mutation rate is lower than in other microorganisms or vegetative expansion of genets requires fewer cell divisions than previously thought (Hodnett and Anderson, 2000).